Western blot analysis of extracts from HeLa cells, transfected with 100 nM SignalSilence® Control siRNA (Unconjugated) #6568 (-), SignalSilence® Bub1b siRNA I (+), or SignalSilence® Bub1b siRNA II #12150 (+), using Bub1b (D32E8) Rabbit mAb #5421 (upper) or β-Actin (D6A8) Rabbit mAb #8457 (lower). The Bub1b (D32E8) Rabbit mAb confirms silencing of Bub1b expression, while the β-Actin (D6A8) Rabbit mAb is used as a loading control. CST recommends transfection with 100 nM SignalSilence® Bub1b siRNA I 48 to 72 hours prior to cell lysis. For transfection procedure, follow protocol provided by the transfection reagent manufacturer. Please feel free to contact CST with any questions on use. 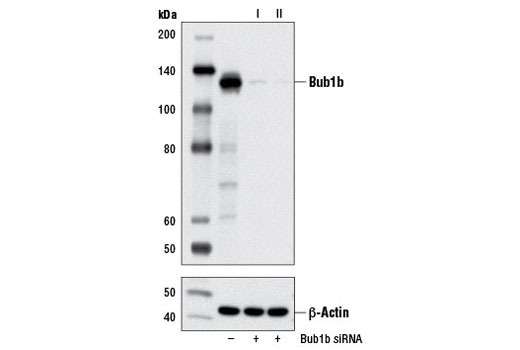 SignalSilence® Bub1b siRNA I from Cell Signaling Technology (CST) allows the researcher to specifically inhibit Bub1b expression using RNA interference, a method whereby gene expression can be selectively silenced through the delivery of double stranded RNA molecules into the cell. All SignalSilence® siRNA products from CST are rigorously tested in-house and have been shown to reduce target protein expression by western analysis. The Mitotic Checkpoint Complex (MCC), which contains Bub1, Bub1b, Bub3, Mad2, and Cdc20, controls chromosome segregation and monitors kinetochore-microtubule interactions (1). During mitosis, the MCC complex inhibits the ubiquitin ligase activity of the Anaphase Promoting Complex/Cyclosome (APC/C), thereby preventing cells with unaligned chromosomes from prematurely entering anaphase (2). Research studies have shown that Bub1b and Bub1 kinases are mutated in several types of human malignancies including hematopoietic, colorectal, lung, and breast cancers (3). Biallelic mutations in Bub1b have been found in mosaic variegated aneuploidy syndrome and premature chromatid separation syndrome (4). Bub1b mouse germline knockouts are embryonic lethal with heterozygous animals displaying genetic instability, early aging phenotypes, and increased cancer susceptibility (5). Bub3 binds both Bub1 and Bub1b, facilitating their recruitment to kinetochores (6), and is required for functional microtubule-kinetochore interactions (7). Fukagawa, T. (2008) Front Biosci 13, 2705-13. Chen, R.H. (2007) J Biomed Sci 14, 475-9. Dai, W. et al. (2004) Cancer Res 64, 440-5. Kops, G.J. et al. (2005) Nat Rev Cancer 5, 773-85. Baker, D.J. et al. (2004) Nat Genet 36, 744-9. Taylor, S.S. et al. (1998) J Cell Biol 142, 1-11. Logarinho, E. et al. (2008) Mol Biol Cell 19, 1798-813.